A few weeks ago we were lucky enough to be sent an amazing pen set and huge box of Rice Krispies from BritMums and Kelloggs so that we could take part in the #ColourMeInRK linky. 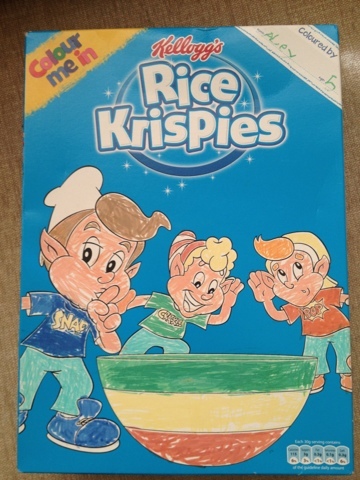 Just in case you can't read it, it says: "Hi, my name is Alex and this is my rice krispies colouring. Thank you for sending me the pen-set - I love it." 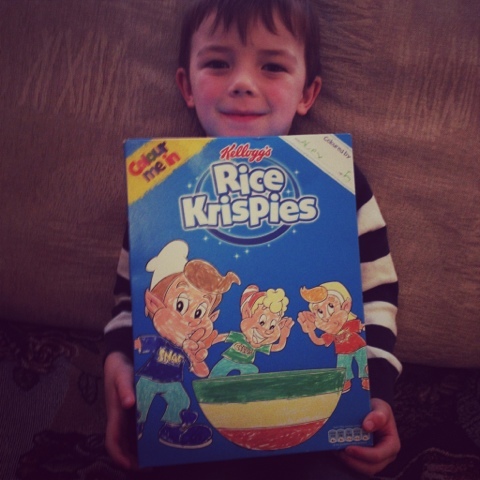 And here's the finished entry for the BritMums #ColourMeInRK competition, sponsored by Kellogg’s. No mother-to-be wants to spend a fortune on maternity clothes – knowing that they will only be worn for a few months, and that there will be many other calls on their purse in preparing for the new arrival. Many women also feel, after the birth of their baby and a return to a more svelte shape, that they want to go shopping for a whole new wardrobe. But neither do they see pregnancy as a time when they have to resign themselves to looking boring or frumpy. The 21st century mum-to-be is proud to display her bump, and doesn’t see why pregnancy should prevent her from looking stylish and elegant. The solution, of course, is to find maternity clothes that are up-to-the-minute but that are not going to break the bank. There are some great online sites where you can find fashionable but cheap maternity clothes. New Look have a wide choice of both casual wear and glamorous maxi dresses for mothers to be, and some great special offers on some of their basic tops and T-shirts. And there’s not a frumpy design in sight! Looking ahead to the fashion trends in maternity wear for the autumn and winter, soft and luxurious materials promise to be all the rage, with jersey and knitted dresses offering warmth and stretch to accommodate the growing bump. Big slouchy cardigans worn over stretchy T-shirts or colourful tunics and leggings offer both comfort and style. For outer wear, padded three-quarter length coats with adjustable panels, or a maternity duffle coat, will keep you cosy throughout the coldest winter. Dresses are knee-length or maxi, with colours being more subdued than this summer’s floral patterns and bright shades. Dark greys, maroons and tobacco browns complement the more classic and elegant cut of the autumn dress, with interest created by the detail of cowl necks or ruched side panels. The long-sleeved stretchy T-shirt will continue to be the great stand-by for the mum-to-be, worn with chunky sweaters and maternity jeans or a box-pleat skirt for every day, and for evening glamour, dressed up with sparkly leggings and a multi-strand necklace for that special night out. P&G have been in touch, with some faboulous news. One of thier amazing products - Ariel Powder - has been awarded 'Best Buy' status from independent consumer magazine Which? for the third time! The Which? Best Buy status is awarded to products and services which have satisfied specific criteria based on the results of rigorous comparative tests and analysis. In this month’s consumer product review, Which? Praised Ariel Powder for its performance on drink stains and food spills such as mustard and tomato pureé, as well as grass, mud and greasy make up - Ariel offers brilliant cleaning results you can see, feel and smell. They’ll also be sending a pack of the prize winning Ariel Powder to make sure your party dress is looking brilliantly clean. To enter just use the Rafflecopter entry form below. There are many ways to enter but you must comment below telling me What three top party tunes would you have played at your ‘Ariel Celebration Party’? to be eligable to win.